These waning days of summer may not be the best time to approach this topic – we’d all like more “lazy, hazy, crazy days of summer,” or at least I would. Now, before you say those are impossible demands, I’d like to ask you to consider trying at least some of them at this time of year when things are changing anyway. And there are real reasons beyond just trying to duplicate what folks did in the past. Science tells us that we all have a circadian rhythm – the internal body clock that governs our daily cycle of biological processes. The term circadian comes from Latin words that literally mean around the day. We have been biologically “hard wired” to this kind of sleep-wake cycle for thousands or millions of years, whereas electricity and lighting up the night has been around for a hundred years or less. Our biology doesn’t adapt change that fast, which means that getting away from your circadian rhythm comes at a price. The price is poor sleep or stress or both. Not healthy choices. – Dim the lights in the evening. Try to work you way up to “no screens” after a certain time in the evening. Play a game, read a book – but no tv or computers. If you must use them, install the free program F.lux (https://justgetflux.com/) on your non-Apple devices to warm the screen color. On your Apple screens, go to “Settings” then “Display and Brightness,” then adjust the Brightness to as low as it can be while letting you see your screen. Then click on “Night Shift” to make your nighttime screen light as “warm” as possible. – In addition, put on your sunglasses to filter out more blue light. That’s the cheapest solution. There are also special glasses you can buy, but if you’re doing this on a budget, your sunglasses are a good start. – Go to bed already! The news and the texts and the emails will be there tomorrow, and you’ll handle it all better on a good night’s sleep. I hope you’ll consider giving these ideas a try. If you do, let me know what happens. What happened to me was that I settled into a 10 pm to 5:30 am sleep habit, fell asleep faster, had time to meditate before everybody else got up in the morning, and started to lose weight again. And if you have questions or want to chat, I’m right here. See you next week. 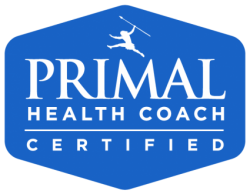 Next Next post: Primal Blueprint Law #6 – Play!